For Jeffrey Oakes, life in the seventeenth century hasn't been the thrilling change of pace he hoped it would be. The lack of power tools, better hygiene, and cold beer has him yearning for the luxuries of his modern-day life. It might all be bearable if he had someone to maneuver the cultural differences and minimal conveniences with-someone with whom he could make a life. But among the Scottish countryside, with women so different from himself, he knows his chances of finding such a woman are small. If only Morna could work her magic for him like she has done for so many others. Kathleen Carter's life is changing. With enough money now saved to fulfill her dream of restoring the castle she inherited, her job as housemaid is coming to an end. All she wants now is for moving day to arrive so that she can get to Scotland. She knows she'll have no time for much of a personal life for the next few years, but that's okay. The ruined castle will take all of the love and attention she has to give. Or so she thinks. Little does she know that a move isn't the only big change life has in store for her and that perhaps her dreams might include more than devoting her life to a big, empty castle. Jeffrey and Kathleen meet when he brings Cooper yo see Cooper's present day family. This, as a result of his living in 1647 leads to misunderstandings and when she goes to Scotland she meets up with him again but under different circumstances. A good addition to the collection that helps build the story line more. Jeffery now lives in the past 17th Century to be either his family. He only wishes to have his own mate to experience life with. Kathleen inherited a castle in Scotland from Jane. Kathleen wants to turn it into a bed and breakfast her dream job. Kathleen ends up in the past and Jeffery finds her intriguing. Can they be happy in the past or will Kathleen go back to the future. Can they over come the obstacles? I live audiobook books because I can download and listen to a book while I'm at work. Bethany thanks for all you do. Your books are great. Do Jeffrey and Kathleen find happiness in the 1700 century? Short sweet story to find Cooper's dad Jeffrey a wife. Cooper and Morna put their heads together to set his dad up with the perfect mate. Although smitten, Jeffrey keeps Kathleen at arms length because he feels he can't tell more people about time travel. When Kathleen and Cooper's aunt Jane travel to Scotland, Morna concots a plan to send the two women back in time where Cooper and Jeffrey are. Jane freaks, but Kathleen is more accepting. loved it. one of the best series I've listened to. a must listen.love love loved it. Enjoyed this novella very much. Good story. Slow start, but worth finishing. I really liked it was primarily from a male perspective. I like the characters and using a child as a common starting point between all the relationships. It had a good logical flow. Made me wonder if there was a book prior. I can never get enough of the Morna's Legacy series. I thoroughly enjoyed this novella just as much as the other books in this series. Cooper is quite the rascal, isn't he? He made the book really fun for me. Of course, It was wonderful seeing Jeffrey and Kathleen fall in love. Would you listen to In Due Time: A Novella again? Why? Yes I would as I have enjoyed all the books in this series by Bethany Claire. I liked that Kathleen thought she wouldn't have a personal life while she was restoring the castle she inherited. Yes and I enjoyed every book in this series very much! Waiting for Love In Due Time. Keep up the awesome books Bethany Claire. As I always enjoy each one! Where does In Due Time: A Novella rank among all the audiobooks you’ve listened to so far? This book rates in my top 5 the narrator does a great job and the story is really amazing. That Jeffrey finally gets his chance at love after sacrificing so much for his child and best friend. The way that she uses a different voice for each character really brings them alive. Yes I did listen to in one sitting. The Morna Legacy series is amazing I have read and listened to them all and they are stories you can return to again and again. 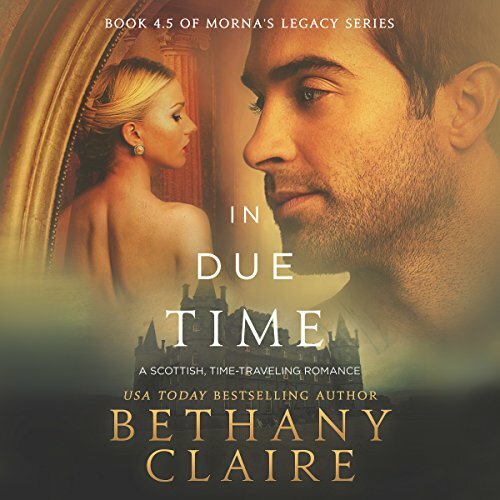 This is a great book; this book is part of the Morna’s Legacy series written by Bethany Claire and narrated by Lily Collingwood. This book can be listened to in one sitting if you have the time, once I started listening to it I didn’t want to put it down until the end. Jeffrey Oakes, life in the seventeenth century hasn’t been the thrilling change of pace he hoped it would be. He decides to take Cooper to visit his Aunt and grandparents in the twenty first century. Kathleen Carter has now enough money to fulfill her dream of restoring the castle she inherited. When Jeffrey and Kathleen meet it is love at first sight. The narrator Lily Collingwood did a great job with this book. She did a great job with the different voices of each character in this book. It was very easy to listen to in one sitting and I didn’t want to stop listening until the end.